Oh, the fun of kids on ponies! I love it! I look forward to hopefully more "dressage fail" posts! I have fond memories of appys. The first horse to throw me was an app, but I didn't blame him. It was a pretty clear day, but there was one random LOUD clap of thunder while we were cantering. Of course he spooked! I twisted my ankle on landing and couldn't use my stirrup, so the rest of my lesson was spent learning about turn on the forehand, turn on the haunches, and sidepassing. I have known some GREAT appaloosas. They tended to be less deadheaded and willing to take abuse than your typical quarter horse (I live and grew up in the land of the QH), but were athletic for the most part, smart, and in some cases very, very nice horses! I'm laughing because the very same thing happened to me a few years ago when I had just started riding my current horse. Luckily it happened during warm-up! That was cute. I am sure the Appy thought it seemed like a good idea at the time. So Cute! I think that pony wants to go showjumping! I could totally see my horse doing this to me. Apparently he wanted to jump instead of do a Dressage test ;). What a nice young rider who did a good job handling her horses little spurts throughout the clip. Ah, but once you get them on your side, you have the advantage of all that appytude at your disposal. I may be less than impartial after raising appies for last 28 years. LOL, WV: cretin. Ok, I may have applied that term to some spotted horse in a time of stress! I think someone forgot to inform him that dressage comes BEFORE stadium... he was certainly convinced he had it right! Cute little fellow though. What it is ... is the Appy wants to be a jumper. Plainly put. LOL. Been there...done that...in an FEI test, no less. I was in counter canter and my horse's balance was not correct enough for the corner. Over and out we went. I evented for years on an Appie who was 3/4 TB. I can't say they are built for dressage, but for good sense and facing strange obstacles without fear, they are hard to beat. Love and loyalty has a lot going for it... I still dream about him and if I could pick one horse in my entire life he would be the one. Anyway, I'm not sure what he was supposed to do instead, run through the fence? You gotta at least point the horse in the right direction! You can see him sighting the fence and lining up for it halfway across the arena, he did EXACTLY what she told him to do. Oh funny! Rider handled it very well if I do say so myself. I was so scared Rosie would attempt the same thing our first test. haha, my husband asked what all the giggling is about... it's just so funny- and typical of a pony! The poor girl was looking around like, "what now? "poor thing. With horses, always expect (and be prepared for) the unexpected and the worst case scenario! Kudus to the Appy! I don't see any effort on the rider's part to turn him. He did good by not refusing. My Appy would've done the same...I love the challenge of the meshing both of our dominant minds together, but I gotta say she would be so bored with dressage, so we don't. It's all fun shows and games and obstacle challenges for us. Needless to say we clean house with ribbons and trophys. I can point her at anything and she takes it all in stride. She can cut a cow, run poles and barrels, jump logs, race trails cutting around trees like an indy driver corners a bend, go through ANY obstacle, pull me up a hill by her tail, and wait patiently if I choose to lead her down a steep incline....Like my decal on my trailer says "I have an APP for that!" I let my friend show jump my Appy mare, and she's never once tried to jump the dressage arena. But I also don't try and ride at the arena Little girl needed to turn a tad sooner. For my first years of riding I was a passenger, until I rode this Appy mare Cookie who made me a rider. Then I switched to an all Appy barn and I fell in love with them. When they give you their heart they give you all. They do get a bad rap, but I don't understand why. One person told me that the US Army started the myth that Apps were crazy, because they didn't want folks breeding them for a risk that the Nez Perce tribe would try and flee again. But not sure if that's true or not. Aww that was sweet! Pretty pony too! 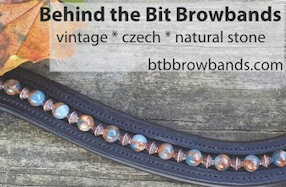 We have some very high quality western style tack, I am trying to build some links. Anyone interested in linking to us, please do!